It will come as a surprise to no one that I don't like to exercise. You can tell that just by looking at me. I'm jiggly and pear-shaped, and wear slacks that don't have the teensiest bit of slack in them. But whether I like to exercise or not isn't important. 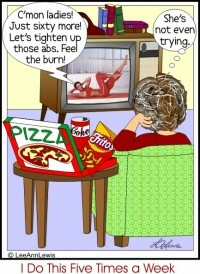 The point is, I need to exercise, and I'm sincerely trying my best to do so. Because I'm a person who would much rather read than exercise, I have accumulated a rather impressive collection of secondhand paperbacks on physical fitness (which I usually read while curled up on the sofa with an enormous bag of Fritos), and all the experts seem to agree that every woman should tailor her exercise program to fit her own particular needs and abilities. The most logical way to determine which personal fitness program is best is by a process of elimination. For me, the first thing to go was jogging. "Hitting the wall" and a "runner's high" were never big on my wish list. Not only that, but I've seen the final result - a woman jogging down the interstate, miles from the nearest town, her leathery brown skin drenched with sweat, rhythmically pushing her spindly little arms and stringy legs forward, with a fixed, glassy, pained hypnotic look on her face. I don't want to be like her. I want to bake her a pie. One of the first things I’ve learned is that there is a huge difference between just walking (as in down the peanut butter aisle at the grocery store) and aerobic walking. According to my rather dilapidated 1978 copy of Dr. Kenneth Cooper's book, "The Aerobics Way", in order to do my body any good at all, I not only have to walk a certain distance, I also have to do it in a prescribed amount of time. As of this week, I've worked my way up to three miles in about 45 minutes, which according to the chart in Dr. Cooper's book, means that I have earned 8 points. Unfortunately, the book is unclear as to what I am to do with those points. Does the person with the most points win? May I cash my points in for a pizza? If any of you know the answer to these questions, please tell me because, as you can see, I am most anxious to find out what I get for all my hard work. I've also found that I benefit most from walking when I do it with a friend. Not only does it require at least twice the aerobic effort to carry on a constant flow of conversation while trudging uphill at a brisk pace (especially carrying the above mentioned hand weights), but it also offers the best possible environment for catching up on all the latest news. Depending upon whom I walk with, I can find out whose husbands have hair plugs, how much the church is paying their new worship leader, and how many of us secretly spy on our kids via Facebook. Now I know some of you will be horrified that a bunch middle aged women are circling the neighborhood chattering away about rumor, hearsay, and scandal, but it's a proven fact – the juicer the gossip, the higher the heart rate. We're only doing it for our health. So come on and join us if you want (I’ll even supply the "hand weights.”) We'll only ask you to follow one rule: Don't walk the walk if you can't talk the talk. Search for That's Me All Over articles similar to "Walk This Way!. Search all articles similar to "Walk This Way! ".